A lot of traders still don’t understand how to draw a strong high probability trend line. They can make the difference between great profits and great losses. Trend lines tend to be more reliable on the bigger time frame’s such as the 4 hour, daily and weekly charts. 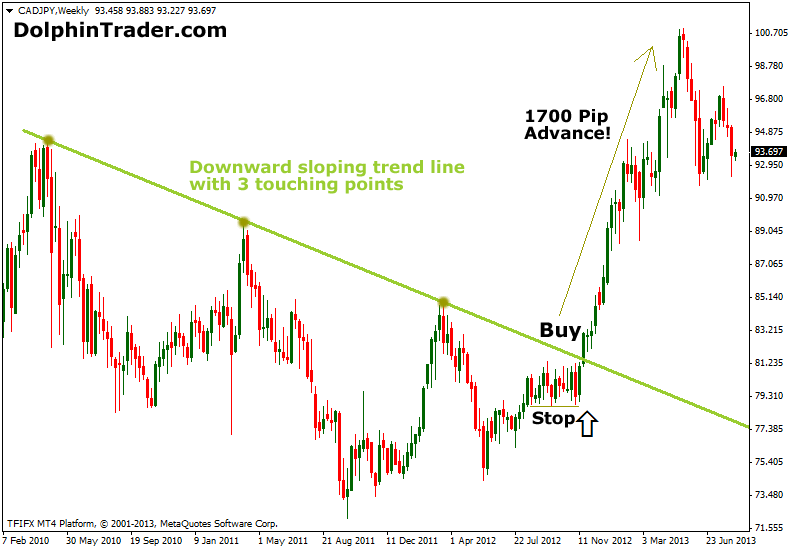 Here’s my little guide on how to find and draw the best trend lines in forex. Drawing strong trend lines in falling markets (downward sloping trend line). Drawing strong trend lines in rising markets (upward sloping trend line). Download the automated WATL Trend Lines Indicator for Metatrader 4. The CAD/JPY chart shows a strong downward sloping trend line with 3 touching points evenly distributed across the falling line. We bought the close above the violated trend line with stop loss being placed below the lost recent swing low point. The price rallied by over 1700 pips. Or use any other exit method.